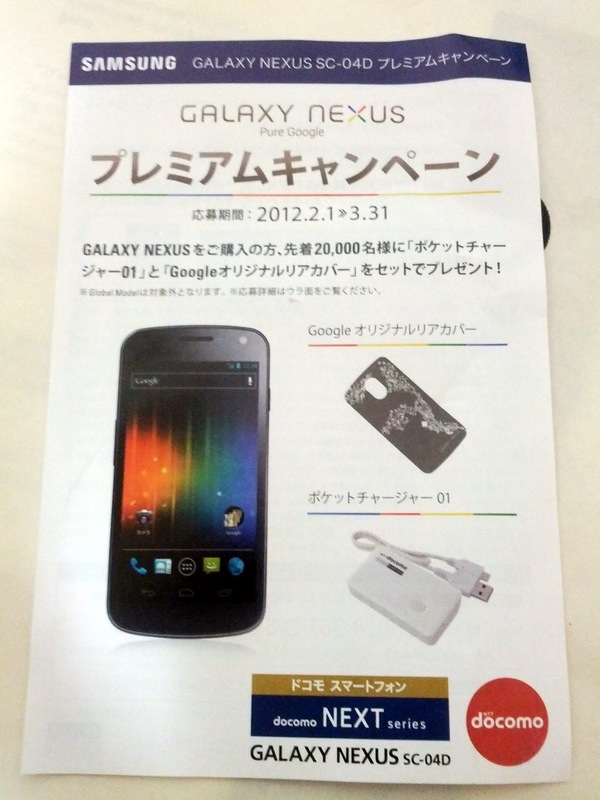 I saw this at my local docomo shop today: the Samsung's Galaxy Nexus SC-04D Premium Campaign. From February 1st to March 31st 2012, those who have purchased/own a SC-04D* can receive both a "Google Original Rear Cover" and a "Pocket Charger 01" (both pictured in the leaflet) as a set present! First come, first served. Limited to 20,000 applicants. Restrictions apply. See rules at your local docomo shop for details. * Sorry, the "Global Model" is not eligible. You must have a Japanese Docomo SC-04D variant of the Galaxy Nexus and live in Japan. To apply, go to a docomo store and use the standard browser on your SC-04D phone and input the QR code / URL. I recently bought a Docomo GNex and signed up for this campaign right away. Oddly, there was no confirmation email or anything after I submitted the form. I wonder if the goods will just show up one day?